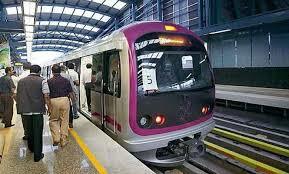 PUNE: Government of India's Department of Economic Affairs (DEA) and the French Development Agency (AFD) signed a Credit Facility Framework agreement for extending bilateral funding to the tune of 245m Euros to fund Maharashtra Metro's Pune Metro Project. Maharashtra Metro Rail Corporation Limited (MAHA-METRO) an equal partnership joint venture of GoI and Government of Maharashtra is currently executing the Pune Metro Project. The estimated total cost of the project is Rs. 11,420 crores of which the loan component is Rs. 5831.5 crores. The loan component is to be funded by European Investment Bank EIB and AFD. The current credit facility signed between DEA and AFD France would be to extend bilateral funding to the tune of approximately 245 million Euros to fund the Pune Metro Project. For Maharashtra Metro, Pune Metro is the second Metro project after Nagpur Metro to be financed by AFD France under the Indo French partnership for clean, socially inclusive and climate-friendly mobility for people in cities. The funds to be received from AFD will be used primarily to fund system packages i.e. Signalling, OHE, Power supply, Telecom and some civil packages. The physical progress of the project is in excess of 27%. The agreements were signed by C.S.Mohpatra, Additional Secretary Department of Economic Affairs, and Clemence Vidal de la Blache, Deputy Director for AFD in India, in the presence of the Ambassador of France to India, H.E. Mr. Alexandre Ziegler. The signing ceremony was also attended by Joint Secretary, Ministry of Housing and Urban Affairs (MoHUA) Mukund Kumar Sinha, Brijesh Dixit, Managing Director, MAHA METRO, S. Sivamathan, Director Finance, MAHA-METRO and Ramnath Subramaniam, Executive Director (Strategic Planning), MAHA-METRO. On December 18, Prime Minister Narendra Modi had laid the foundation stone for the third phase of the Pune Metro rail while asserting that Metro is becoming the lifeline of cities in the country.